Finlandia is a vodka produced in Finland from Finnish-grown six-row barley and glacial spring water. The barley is distilled into a neutral spirit using a continuous multi-pressure distillation system at a distillery in the village of Koskenkorva operated by Finland's Altia Corporation. The distilled alcohol is then transported to a production facility in the village of Rajamäki, about 45 kilometers (28 miles) north of Helsinki. In Rajamäki, the spirit is blended with glacial water, flavored (except for the classic non-flavored edition, 101 and Platinum), and bottled. 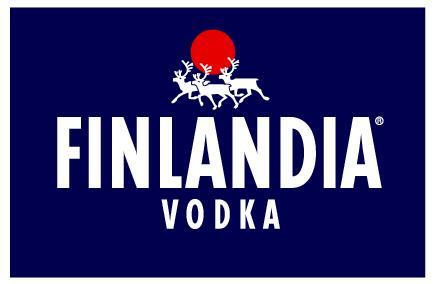 The Finlandia brand was established in 1970 by Alko, Finland's state-owned alcoholic beverage company. A year later, the brand became the first Scandinavian vodka to be sold in the United States. Finlandia is now owned by the Brown-Forman Corporation. Finlandia vodka is distributed in 135 countries and is widely associated with Finland on the international market. Flavors include cranberry (since 1994), lime (1999), mango (2004), red berry (2004), wild berries (2005), grapefruit (2006), tangerine (2009) and blackcurrant (2009). Wine Enthusiast 98 "The fresh, citrusy, acidic, juicy, just-squeezed grapefruit is unbelievably attractive and genuine. The palate entry is engagingly juicy, tart and ripe; by midpalate the grapefruit flavor is so authentic it is more like an infusion. Finishes as seductively as it began."" "Finlandia Tangerine Flavoured Vodka is inspired by the warmth and light of the Mediterranean sun. The sweet citrus aroma and taste of the fruit, artfully combined with the world's finest vodka, creates an irresistible flavour as pure as our glacial spring water and as unique as our six-row barley.